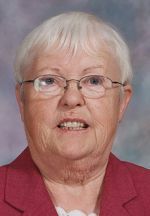 Sister Elena Goulding, O.S.F., 81, died April 7 in Assisi House, Aston. She had been a professed member of the Sisters of St. Francis of Philadelphia for 63 years. Sister Elena (Bridget Philomena Goulding) was born in Knockanure, County Kerry, Ireland. She entered the congregation in 1949 and professed her first vows in 1952. Sister Elena earned a B.A. in English from Neumann University in Aston, and an M.A. in education from Johns Hopkins University in Baltimore, Maryland. She ministered primarily in education, prison ministry and elder care. Sister Elena ministered for 26 years in the Archdiocese of Baltimore as a teacher and a prison chaplain at the Women’s Detention Center. She also ministered in the Diocese of Wilmington and in Washington, D.C., and South Carolina. In 1993 Sister Elena returned to her native Ireland where she ministered for 14 years. In 2008 Sister Elena moved to Assisi House, where she served in prayer ministry until her death. The funeral Mass was April 14 in Assisi House. Burial was in Our Lady of Angels Cemetery in Aston. Sister Elena is survived by two sisters, Mary Clancy and Patricia Danaher; two brothers, Christy Goulding and Michael Goulding; nieces and nephews, and by her Franciscan family. Donations in her name can be made to the Sisters of St. Francis Foundation, 609 S. Convent Road, Aston, PA 19014.